The Maltese Catacombs were never meant to be hiding places during persecutions or as living quarters. They were underground cemeteries consisting of long narrow corridors with tombs on each side and vaults. Some of the tombs are even decorated with reliefs and frescoes. In almost all graves there is found the head rest, a sort of rock pillow. In each grave there is a semicircular cavity where the head of the deceased person is rested in its position. These cavities denote how many people were buried in each grave. 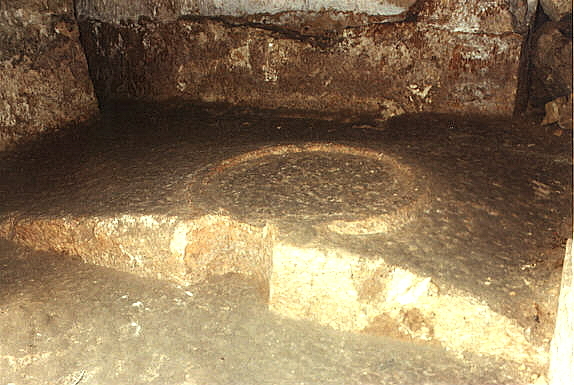 Another interesting feature in the Maltese Catacombs is the Agape Table, probably used as a table for the final farewell repast. This is a round table hewn out of the live rock about 60cm or more above ground level. These tables slope gently downwards towards the circumference of the chamber. At the upper part they form the round table, flat and encircled with a rim about 6cm wide and 3cm high. Generally these tables are about 75cm in diameter. On the front part, a small section of the rim is opened. Probably this served to clean and wash the table when the meal was over. 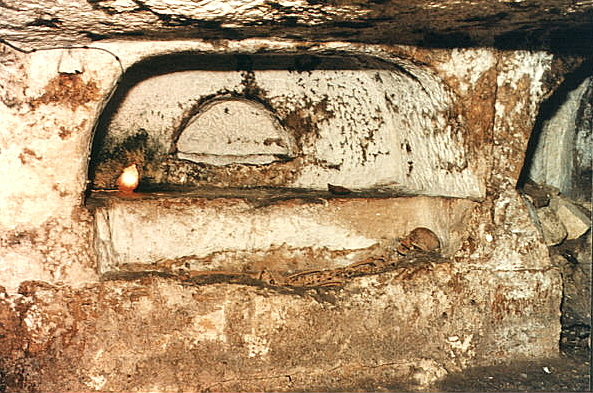 The different types of tombs are another feature that distinguishes the Maltese Catacombs. The most important of all is the "saddle-back canopied table grave". The upper part of the tomb, that is the cover, is like a saddle-back of a horse, which was either cut from the same rock or was placed when the internment took place. The canopy above is supported by four short pillars ending in arches on the four sides. At the back of each pillar, on the internal side of the tomb, there are horn like pillars as a decoration. Another type of grave is the "canopied table grave" in Italian known as tomba a baldacchino. These are also cut in the rock having four pillars to support the ceiling above, while forming arches on each side of the tomb. These make a sort of canopy above the grave, while when the funeral was over and the grave sealed with stone slabs, it seemed to form a table, hence its name. 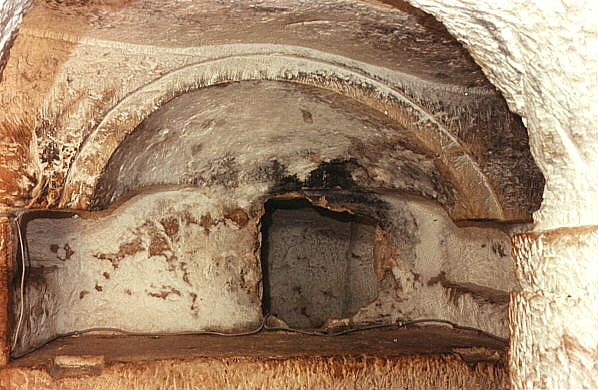 The arcosolium is so called on account that at the entrance of the tomb, it has an arch and a sill (L. solium). Such graves are cut within the side walls. The back of the arch is a sort of half a dome. The entrance to these graves is through a square opening about 45 cm each side, while the grave is hidden by the wall. Window graves are very similar to the arcosolium, except that the back is flat within the vault. The entrance is also similar to the previous one. Loculi are side graves hewn in the side walls. Most of these were meant for children and babies. At times many of these are found near each other and very near to a parent tomb, denoting that they belong to the same family. Very frequently, one can notice many small niches cut in the side walls. These were used to hold an oil lamp to light the whereabouts. Many niches still bear soot marks. 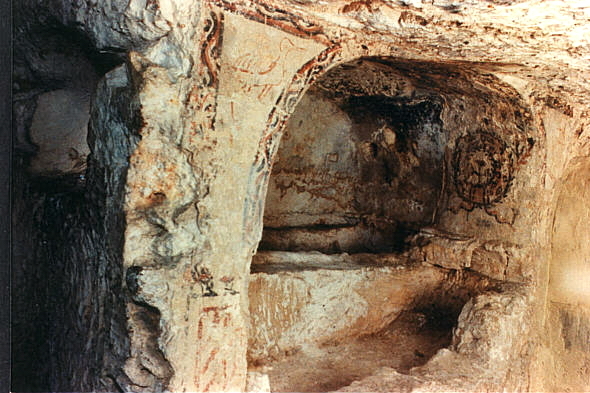 Two of the tombs at St. Agatha's Catacombs are decorated with mural paintings. On th e wall near the head of one of theses tombs, there is a Greek inscription, which was deciphered by Rev. A. Ferrua SJ. It states: "Before the Calends of September, Leonias was buried here." This inscription has suffered through negligence throughout the years and it is difficult to read. The other tomb, which is a table grave, is decorated with frescoes that were hidden under a layer of 6cm of mortar. A coloured frieze goes round the edges while a pelican in red ochre is seen on each side. On the inner sides, there are floral wreathes consisting of pink roses, green leaves and three roses in the centre of the wreath. It seems that on the back of the grave there are more frescoes which still lie hidden by more mortar. One of the chambers in these catacombs seem to be the Sancta Sanctorum, of this Christian catacombs. It has a radius of 275cm and is decorated with a pillar on each side. There is a capital on top of the pillars which are joined with a frieze which goes all round the chamber. On one side there is an arch which is the altar of this primitive chapel. 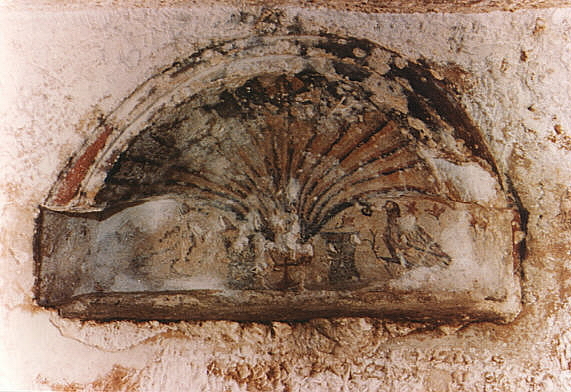 It is decorated with a 3rd century fresco representing a scallop shell painted in various colours: red, ochre, dark green, yellow and pale yellow. The front lintel is painted in dark red and dark brown. It symbolizes the source of life, that is God. In the middle there is a cross with the Greek letter R (rho) with a horizontal line passing through its middle, an artistic variation of the Greek letter C (chi), and this symbol signifies Christ. On the ends of the horizontal line, there are the A and W (alpha and omega) which signify that Christ is the beginning and the end of life (cfr: Rev 1:8; 21:6; 22:13). Apart from the flowers, on both sides of the fresco, there is a dove with leaves or flowers in its claws. This is the best fresco that exists in the Catacombs and it is of the earliest age of our Christian era.